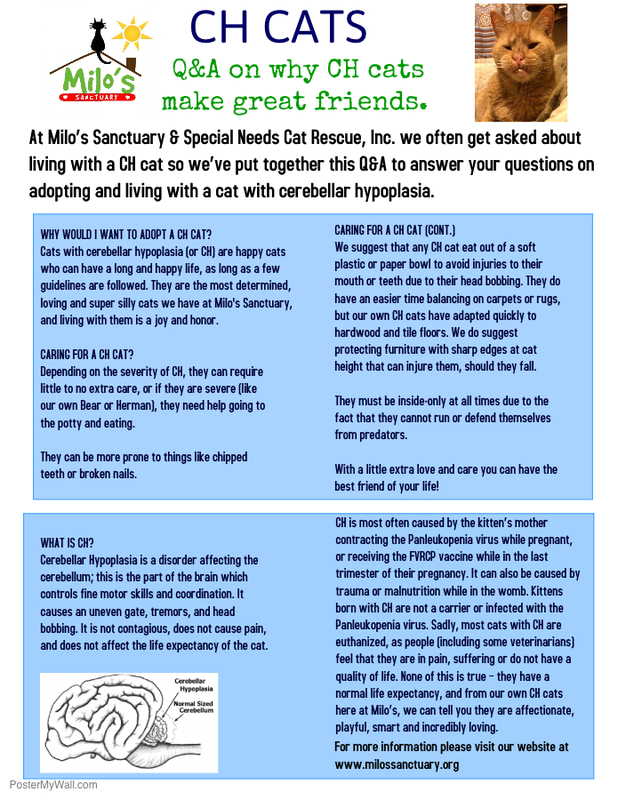 Cats with Cerebellar Hypoplasia, like our friends Herman and Bear, have unique behavior and needs. Click here to learn more about CH cats. Do you share your life with a cat with CH? The CH Kitty Club is an online resource for caregivers to CH Cats. Click here to visit their site. 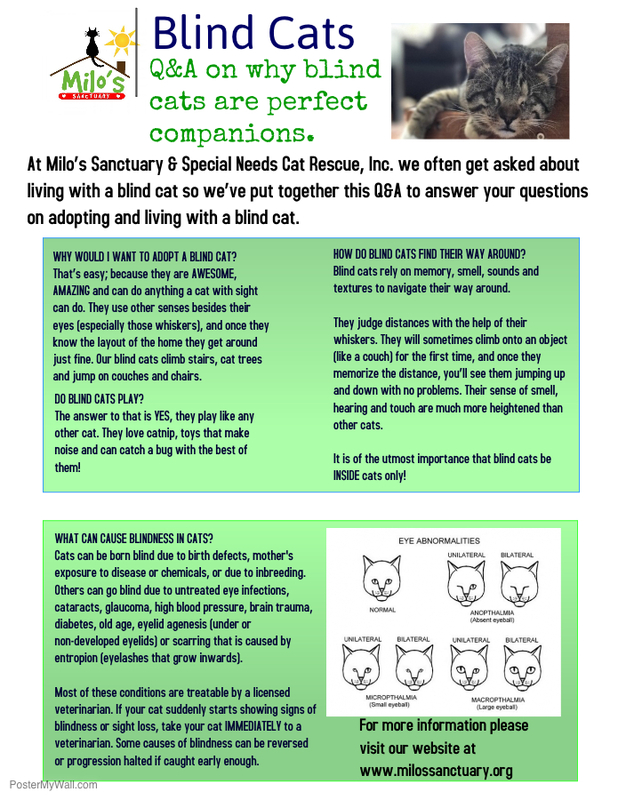 Milo's Animal Care Team has great information about living with blind cats. Cats can suffer paralysis as a result of numerous conditions. If you're caring for a paralyzed cat, it will require dedicated efforts from you in order to maintain a good quality of life. 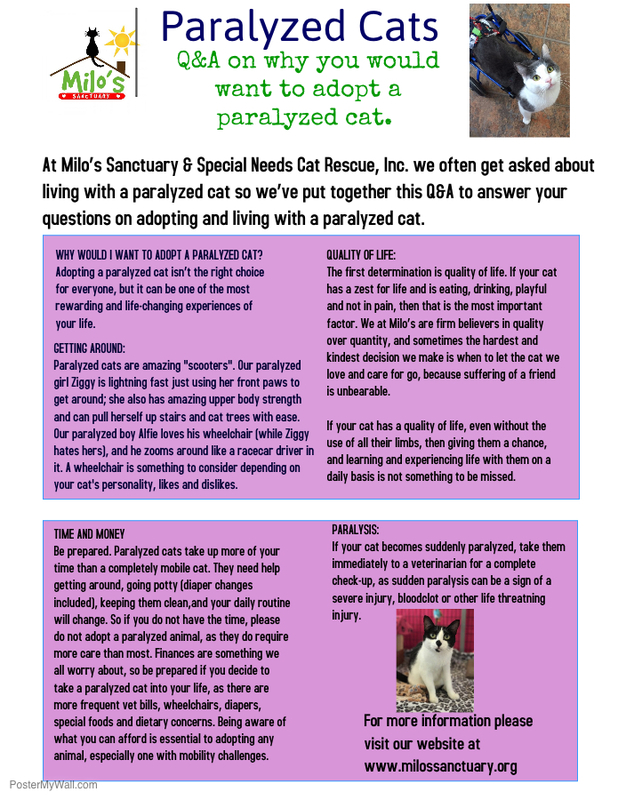 Click here for more information on caring for a paralyzed cat. Looking for tips for on caring for a paralyzed animal? This link offers 12 tips for caring for your furry friend. Senior cats are the BEST! Cats over 9 years old are now considered "seniors", despite many living to their late teens and beyond. Seniors need some special attention. Our Animal Care Team have these tips about providing care for our older feline friends. 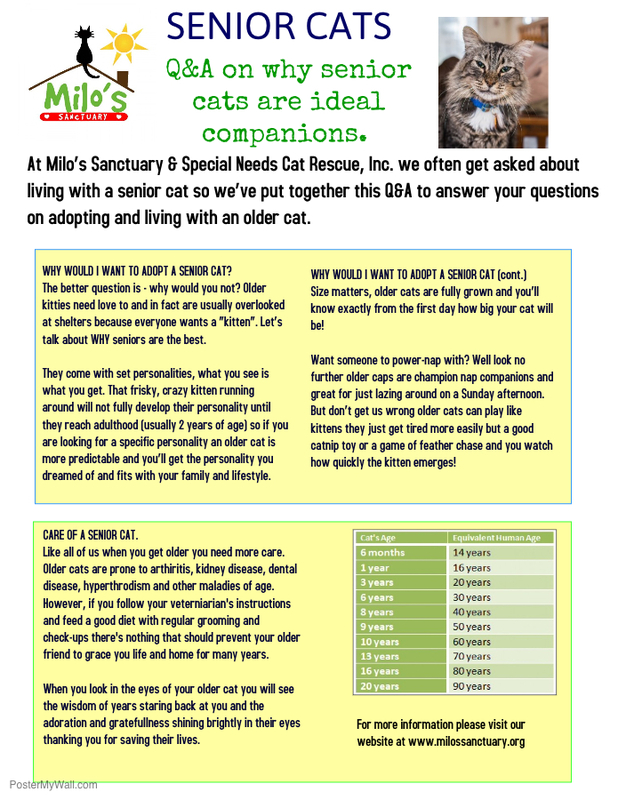 What exactly IS a senior cat? Click here to read more about how cats age and what to expect as your furry companion gets older. 1. Have you taken the cat to a veterinarian for a check-up? Cats will sometimes avoid litter boxes and use something soft, like rugs, towels, beds, etc. when they have a bladder infection. Your first step should be to take the cat to your veterinarian for a check-up. How often do you scoop the litter box? Even with one cat, the box should be cleaned once a day. Imagine having a roommate or two or three and you only flushed the toilet once a week (yuck!). Have you changed the type of litter you’ve been using? What type of litter is it? Is it scented? Remember: a cat’s sense of smell is much, much better then ours. If it smells bad to you, imagine how it must smell to them. A good clumping unscented litter works the best. Have at least two inches of litter in the box at all times. How old is the litter box? At least once a year we recommend tossing the old litter box away and getting a new one. NEVER clean the litter box with harsh chemical (especially ammonia), just soap and water will do the trick. Is the litter box covered? Some cats prefer them covered, some prefer them open. Try both and see which your furry friend prefers. Also, make sure the box is big enough for them to stand in and turn around comfortably. Where is it located? Is it a quiet, out of the way please or right in a traffic zone? Is it away from other animals (like dogs) and children? We all like our privacy in the bathroom, cats included. More then one cat always means more than one litter box. The rule is the number of cats + 1. So, if you have 2 cats, you should have 3 litter boxes. Have you cleaned the soiled areas in your home COMPLETELY? We only use Anti-Icky Poo or Zero Odor to remove cat urine. These products are the best for removing urine from your home. Do you have a new roommate or significant other? Sometimes, cats mark to show you that they are upset. We cannot tell you how many times we have gotten calls from very distraught men and women telling us the cat has suddenly started to pee on their bed or clothes. Our first question is always, “so, when did you get the new boyfriend/girlfriend?” People are always surprised to learn that the cat is trying to tell you he’s jealous and upset and prove that you are his property. If this is the case, keep the rooms closed where he’s been urinating and be sure to clean the area well. Have your new significant other feed the cat, play with the cat, and give the cat treats. It works miracles! First, declawing. We only have one thing to say on this subject: DO NOT EVER, EVER, EVER DECLAW! It’s mutilation; it’s beyond painful, unnecessary, and can cause deep psychological problems. DECLAWING IS NOT REMOVING THE NAIL; IT’S AMPUTATION OF THE CATS TOES!!!! 1. We highly recommend buying a sisal rope and/or cardboard scratcher(s). Purchasing a scratcher made out of carpet is going to defeat the purpose of trying to train them not to scratch on carpet or couch, chairs, etc. 2. Once you’ve brought the new scratcher into the house try rubbing catnip or spraying it with a catnip spray to entice your feline friend. When they do use the scratcher, reward them with lots of praise and petting. 3. If you see your cat scratching on a surface you don’t want him to scratch, simply take a squirt bottle full of water (only water) and spray them. Do not yell or scold them, simply squirt them and go about your business. You don’t want them to associate you with the squirt bottle. They should associate the scratching on the couch, carpet, or other surface with getting wet. Cats are very smart and learn and adapt quickly. 4. NEVER, for ANY REASON hit or spank your cat. Hitting will have a cat terrified of you, other people, and of being touched. Remember: they DO NOT understand why you are hitting them. Scratching is a natural reflex and if you don’t want an animal that scratches things, do not get a cat. 5. Soft Paws are another alternative for cats who scratch. For more information on cat scratching, click here. ​To read more about declawing, please click here. Need A Veterinarian or Help With a Stray Cat? Milo's recommends Beverly Oaks Animal Hospital as their primary veterinarian. They are open 24/7! Need help with feral cats in your neighborhood? Contact Stray Cat Alliance. Need low-cost spay/neuter clinic or vaccines for you cats? Visit Fixnation. Our friends at 1-800-Pet-Meds have some great advice when adopting a cat. Click here to learn more! Looking for an Animal Communicator? We work with a wonderful pet communicator, Sultani Trip. You can learn more about his work by visiting his website.